Kenneth E. Anderson - Department of Poultry Science, North Carolina State University, Raleigh, NC, U.S.A. Alternative production systems of cage-free or range egg production are increasing in number due to outside influences. 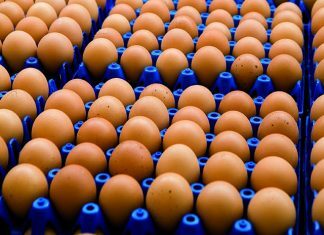 The outside constituents forcing this growth are creating great changes to come about and with this change an uncertainty in relation to the future for intensive egg production. 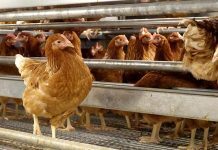 Concerns still exist about the impact on the use of the cage environment on laying hen well being, but along with this are the concerns related to the cage free and range systems. The objective of this study was to examine the performance and egg quality, and component percentages on eggs from hatch mates of two commercial brown egg strains. To examine differences in production performance between hens reared in caged, cage- free and range environments, Hy-line Brown (HB), Hy-line Silver Brown (HSB) and Barred Plymouth Rock (BPR) layers were hatched and grown at the Piedmont Research Station, Salisbury, NC. The flocks of pullets were reared in a manner which facilitated their learning the function of the many aspects of the laying environment, since it is imperative that pullets learn to properly use the facilities in the production environments such as range, roosts, and nests for egg production, and foraging behaviours to ensure productivity of the flock. Both Hy-Line Brown layers were reared using three different systems depending on the production for which they were intended i.e. range, cage-free, or cage. The Heritage strain was only reared in cage-free and range setting due to hatch numbers. The cage birds were reared in an environmentally controlled brood/grow cage system at 310 sq cm/bird. The chicks were hatched from the same group of eggs then separated into range and cage-free birds that were started in coming led floor pens on litter at 929 sq cm/bird. The range pullets were moved to the range at 12 wks of age to complete their rearing. The birds were maintained on the same rearing dietary regimen, vaccination, and supplemental lighting program throughout the rearing program until 12 wks when the range birds went on natural light supplemented with controlled day lengths. There were 6 replicates (2 for each strain/breed) for the range system, which consisted of 75 hens each. The cage-free system consisted 8 replicates (3 for each commercial strain and 2 for the Heritage breed) of 216 hens each. The cage system consisted of 22 replicates (8 for each commercial strain and 6 for the Heritage breed) of approximately 20 hens each. Hen performance was monitored from 17 to 85 weeks of age on a 28-day period basis. 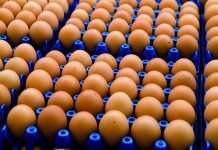 Production records commenced with the first period and consisted of feed intake, production records, and USDA egg quality were collected each period, while shell strength, Haugh unit, yolk colour and component percentages were collected quarterly. Bird weights were taken at 17 weeks and at 85 weeks to compare the hen development between the two systems and a final necropsy to look at parasite levels. In order to provide consumers with a more conclusive comparison of husbandry practices associated with the production environment, a study also examined the effect of beak trimming on range and cage-free production environment.The beak-trimming study consisted of 4 range replicates and 4 cage-free replicates using a single strain HB. Within this study all production criteria were compared. The man-hour study consisted of 8 range replicates 24 cage-free replicates and 4 cage replicates. The time spent working within each of the replicates was recorded by personnel and time to within 1 minute. This was the converted to man-hours/hen for the production period. The commercial pullets reared in cages were heavier by 90 g than cage-free and 32 g than range counterparts. However, total feed consumption was reduced when the pullets were reared either cage-free or on the range by about 2.68 kg, which represents a 35.5% reduction. This reduction in feed consumption may be due to excessive feed waste in cages or the replacement of the feed with other foraged materials. 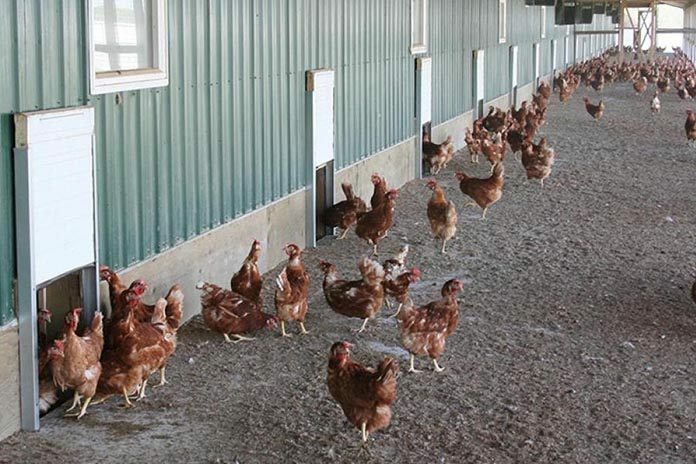 There was a stepwise reduction in flock uniformity between the cage, cage-free, and range reared pullets. This data indicates that pullets reared on the range consumed less formulated feed and thus had lighter body weights than their caged counterparts. However, the cage-free pullets were the lightest. The heritage strain BPR was only compared between the cage-free and range environments. The BPR pullets were heavier on the range and consumed more feed than their cage-free counterparts. Liveability was no different for the BPR but uniformity decreased by 16% in the range pullets. The Hen-day production was actually higher (P<0.01) in the range hens but the cage birds had significantly better (P<0.05) in Hen-housed production. Feed conversion rates were the same in all 3 environments at 0.48 g egg/g feed. Total mortality was significantly higher in free- range hens at 22% while the cage-free and cage hens’ mortality was not different at 8.7 and 5.1 %, respectively. Egg weights were heavier in caged hens by about 0.8 g with a lower percentage of Grade B eggs (1.7 % vs. 2.8 and 2.4 % for cage-free and range, respectively). The eggs from Range hens had shells with similar strength but the elasticity of the range eggs was greater which enabled the eggs to withstand greater minor impacts. Range eggs had darker yolk colour than the cage or cage-free hens. The cage-free hens produced eggs with the greatest percent shell with the lowest percentage of blood spot eggs. Other broken out quality factors were similar between all 3 environments. There is a sector of the production industry that works with Heritage breeds for egg production. There is a belief that they have better foraging and production characteristics for the more extensive systems such as cage-free and range. There also appears to be societal perception that the eggs form Heritage breeds may have a better nutritional profile but that will not be addressed herein. We compared the performance of HB, HSB, and BPR in the three production environments. The HSB hens had the highest (P<0.01) Hen-day production at 85.7 %, the HB hens were intermediate at 83.9 %, and the BPR breed produced at the rate of 52.3 % from 17 to 85 wks. In fact the BPR breed had the poorest production characteristics in all categories. The egg weights in the BPR breed were 7 to 8 g lower than the commercial strain which resulted in a shift in egg size distribution from Extra Large down ward with significantly higher percentages of Large, Mediums, Small and PeeWee eggs. In fact the BPR strain corresponded with the 1958 random bred control strain discussed in Jones et al., (2001). Beak trimming remains the primary method to control cannibalism mortality and feather pecking in egg layers. However, beak trimming is criticized as inhumane by welfare groups due to the pain and permanent alteration of the beak structure. They suggest that range and cage free birds may not need to be beak trimmed. This study only examined beak trimmed and non-trimmed hens in the cage-free and range environments with the only difference being the beak treatment. Beak trimming had no effect on hen-day production but hen-housed production was higher in the trimmed hens. This indicates a difference in mortality which was shown to be 11.8% higher in the non trimmed hens. There was a beak trim by production environment interaction. There was no difference between mortality in the trimmed groups regardless of the environment but in the non-trimmed group mortality was highest in the non-trimmed cage-free group. This seems to indicate that the hens in the range setting were better able to escape the cannibalistic hens whereas the hens in the same cage-free pen were not. There is also a difference in mortality in the range paddocks indicating that cannibalism may actually account for an added 9% in the range setting rather than predation. However, feed consumption per hen was higher in the non-trimmed hens which may indicate that hens with intact beaks tend to waste feed. Egg weight was greatest in non-trimmed hens with no difference in USDA Grades. The time required to provide for the care of the individual hens is overlooked as the egg industry is asked to shift from conventional cages to cage free or even range systems. In this experiment the evaluated man-hour commitment associated with three different environments was elucidated. Three production systems were evaluated including a free range system (R), cage- free (CF), and cage system (C). Within the R, CF, and C systems three strains of birds, Silver Brown Hy-Line (SBH), Hy-Line Brown (HB), and Barred Plymouth Rock (BPR) were examined to see if there were strain differences associated with care as well as the environment.There were some interesting findings with man-hours. As hens age the man-hours/hen decreases on a hen housed basis from .06 hr/bird to .04 hr/bird, but the man-hours/hen surviving increases by 25%. This is related to the mortality in the flock and the need for facility maintenance with use. 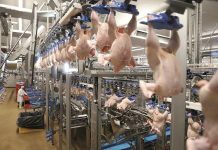 The production environment influences man-hours/hen, with cages require the fewest hours 0.35 hr/bird, cage-free is intermediate 0.52 hr/bird, followed by the range that requires 4x and 3x the time of cage and cage free environments, respectively at 1.51 hr/bird. The different strain/breed requires similar time commitments. Overall there were no performance advantages associated with range production. In fact the range hens had the lowest hen-housed production and greatest mortality. In addition, the eggs produced by the hens with full range access had no quality advantage, but there were differences associated with the yolk colour with the range hens producing eggs with darker pigmentation of the yolk material. Beak trimming appears to positively impact production characteristics which favour the continued use of beak trimming. However, the performance of range birds appears to be better than the cage free counterpart the HH production shows the impact of a significantly higher mortality in the range system. Moving from intensive (C) to extensive production systems requires significant increases in time commitments; 45 % increase in man-hours C to CF; 279 % increase in man-hours C to R; 161 % increase in man-hours CF to R.
From Proceedings of the “Midwest Poultry Federation Convention”, St. Paul, Minnesota, U.S.A.